Saudi Aramco is keen to develop the wealth of unconventional gas resources in Al Hasa, apart from establishing the King Salman Energy Park (Spark) between Al-Hasa and Dammam, as part of its effort to create more opportunities in the region. Through its participation in the two-day Al-Hasa Investment Forum organised by Al-Hasa Chamber of Commerce and Industry, Saudi Aramco aims to pave the way for increased domestic and international investment, promote the national economic diversification programmes and create more job opportunities in alignment with Saudi Vision 2030, a statement said. The Al-Hasa Investment Forum kicked off today (March 20) under the patronage of Prince Saud bin Naif bin Abdulaziz Al Saud, Amir of Eastern Province; with the attendance of Prince Badr bin Muhammad bin Jalawi Al Saud, Governor of Al-Hasa and Head of the Higher Committee organising the forum; Minister of Energy and Mineral Resources, Khalid Al-Falih; and Amin H Nasser, Saudi Aramco President and CEO. The forum is a platform for enhancing investment in Al-Hasa through highlighting investment opportunities in the public and private sectors as well as shedding light on its key components and comparative advantages. Participants will discuss investment opportunities in the energy industry; conversion industries; healthcare; housing and real estate development; education and training; and the overall investment climate in Al-Hasa. Amin Nasser said the growth prospects for Al-Hasa within Saudi Vision 2030 are promising. Placing Al-Hasa on the Unesco list of World Heritage and its selection as the Capital of Arab Tourism 2019 are testimony that these achievements generate positive movement on several levels and enhance the attractiveness of Al-Hasa. In the field of localisation of industries and services, Nasser said the company has recently commenced the establishment of King Salman Energy Park (Spark), located between Al-Hasa and Dammam. This mega project and the pioneering park will be an ideal environment for attracting local and global investments and for creating more jobs for Saudi people. 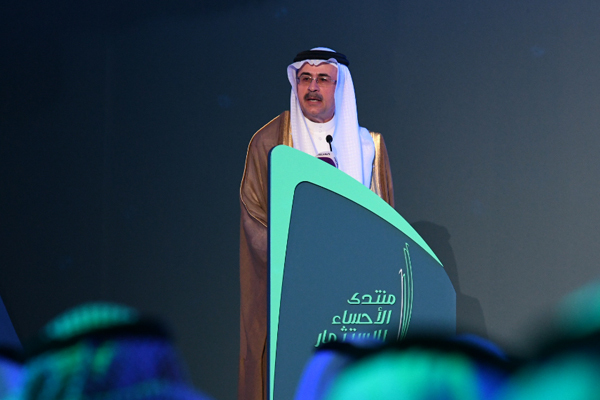 Nasser also announced Saudi Aramco’s plans to establish a large and modern driving school for women in Al-Mubarraz. The centre is expected to train several thousand women drivers annually. It will be managed by qualified Saudi women, and it will train both Saudi Aramco female employees and Saudi women in general.